Whiplash is most commonly received by passengers in a motor vehicle that is struck from behind by another vehicle. When the head is suddenly “jerked” back and forth (“whipped”) beyond its normal limits, the muscles and ligaments supporting the spine and head can be overstretched or torn. The soft, pulpy discs between spinal bones can bulge, tear or rupture. Vertebrae can be forced out of their normal position causing stiffness, pain and nerve damage. The spinal cord and nerve roots in the neck can become stretched or irritated. This is all possible even with little damage to the vehicle. In fact, research shows that increased “crushing” (as seen with higher-speed impacts) of the vehicle actually absorbs some of the shock of the impact and can lessen injury to the car’s occupants. When “crushing” does not occur (as seen with lower-speed impacts), nearly all of the shock is transferred to the driver and passengers. Whiplash symptoms may include headache, dizziness, blurred vision, pain in the shoulder, arms or hands, reduced ability to turn and bend, and even low back and leg problems. 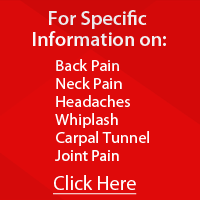 These symptoms may appear immediately following the accident or as much as 2 weeks after the injury. The human body will attempt to immobilize injured areas following a trauma. This usually begins with “protective” muscle spasm (as the name implies, the spasm is attempted to prevent further harm by immobilizing damaged joints and muscles). If function is not restored within 4-8 weeks, then scar tissue will be laid down at the site of injury; hampering the return to full function. This will eventually lead to increased bone growth with the joint causing joint degeneration. All of this, however, can occur with little to no pain. A study in the Journal of Bone and Joint Surgery stated that “…an individual involved in a motor vehicle accident is nearly 7-times more likely to suffer neck degeneration within 7-years of the accident…” than individuals that have not been involved in an auto accident. The goal of chiropractic care is to return the injured joints, muscles and nerves to complete, healthy function thereby reducing this increased risk of degeneration. Chiropractic Adjustments return joints to their proper motion and position allowing your body to regain its lost function. This often relieves pain caused by inflammation trapped within the joints and reduces strain on tight, fatigued and spasmed muscles. Chiropractic adjustments are also effective in reducing pressure on “pinched” nerves and joint irritation often associated with headaches. Muscle Therapy following an auto accident is beneficial at reducing the pain associated with muscle spasms and is also effective at preventing muscle inflammation from converting to scar tissue within the muscle (one of the prime contributions to chronic pain following an accident). Ice and Medications Ice, anti-inflammatory medications (Advil, Ibuprofen, Motrin, Alieve), painkillers and muscle relaxants can offer short-term relief, but do not address the source of the pain. These methods only mask the symptoms and can sometimes be harmful especially if it allows the injured person to perform activities that should be avoided until significant healing has occurred. There have been some studies that show these anti-inflammatory medications can actually delay the healing process. Remember: Pain and muscle spasms are both protective responses that attempt to prevent further damage.